A versatile 8.4 metre sport fisher or a spacious motor cruiser with flybridge which comfortably seats two. The Starfisher 840 is an ideal cruising boat which provides spacious accommodation and with its wide open deck, plenty of room for fishing. The large windows provide light and airey full 360 degree vision internally and there is great visibility from the flybridge. She has two large lazarette lockers in the cockpit, equal spaced side decks leading to a large foredeck with electric windlass and bow thruster fitted. Internal accommodation comprises of a saloon dinette for four sitting this is also then transformable into a bed/berth of 176 x 76 cm. A galley to starboard side of the saloon including your main helm position to starboard. Stepping down to the forepeak you have a good sized heads to port and a very spacious double forward cabin. The boat appears to be in good condition and has been antifouled November 2018. She has also had a basic engine service November 2018. Please note the instruments on the flybridge are covered for the winter period. 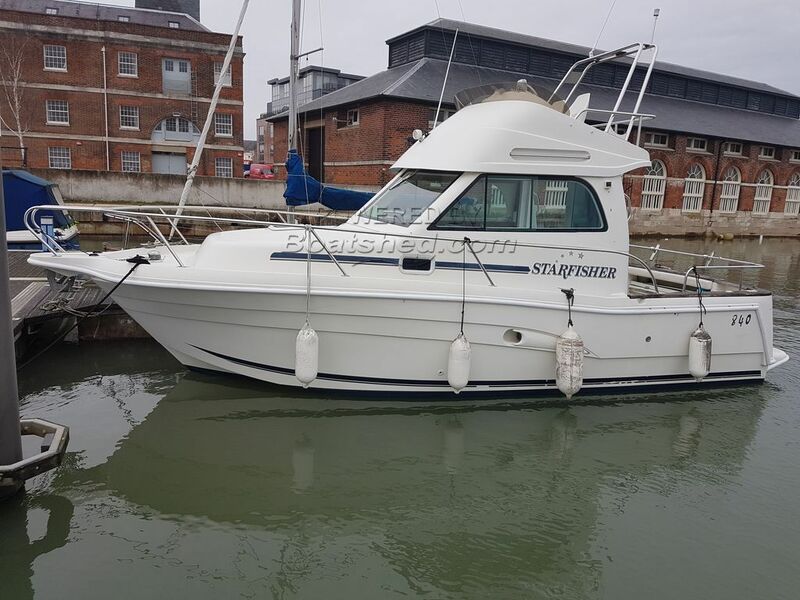 This Starfisher 840 Flybridge has been personally photographed and viewed by Samantha Cassell of Boatshed Portsmouth. Click here for contact details.